In 5 minutes, you can have a bold flavorful meal that fits your busy schedule! 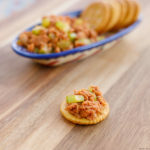 Crunchy tuna sriracha is a great source of lean protein to help you stay fueled! Open the pouch of StarKist Tuna Creations BOLD Sriracha and put it in a small bowl. Add the celery to the bowl and mix together. Spread over your favorite crackers and enjoy! Nutrition information includes 5 Ritz Crackers. Different crackers may yield different results.